I took a walk around the basin first thing this morning and photographed the aqueduct. 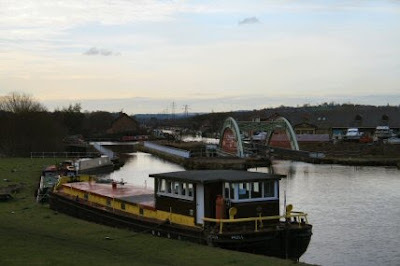 Wkikpedia - Stanley Ferry Aqueduct was built between 1836 and 1839 to take the Aire and Calder Navigation over the River Calder. It is one of the earliest compression arch suspended-deck bridges in the world and is considered to be the largest aqueduct executed in cast iron. 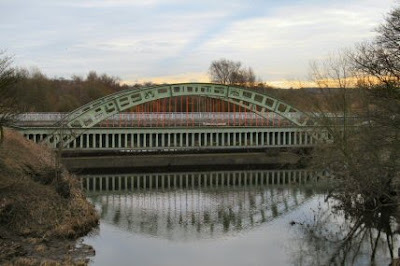 Designed by George Leather and built by H. McIntosh, the aqueduct has a span of 50.3 metres (165 ft), a width of 7.3 metres (24 ft) and a depth of 2.6 metres (8.5 ft). It is still in use today, though an additional wider concrete aqueduct was constructed alongside in 1981 and the bridge was then renovated. 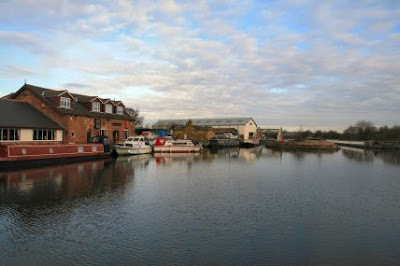 The large brick building on the left is the restaurant and behind it is a boatyard. The large white building is the BW workshop. 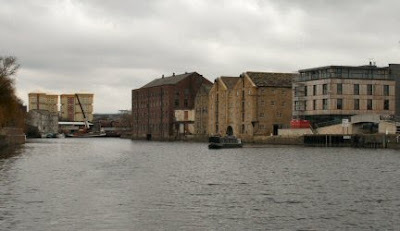 As the Grade II Listed Newlay Locks are a three-rise lock staircase, one of several along the eastern part of the Leeds and Liverpool Canal, this means that there were four pairs of new gates to be craned into place! The new gates were made at BW’s Stanley Ferry workshop near Wakefield. As well as the new gates, work at the locks includes repairs to the floor of the entrance to the lock and replacement of the cills and quoins. The timber planking to the floor of the middle chamber will also be renewed as well as grouting to the walls of the bottom chamber to prevent leakage. The old lock gates, which have been in operation at Newlay for over 25 years, will be recycled and reused for other projects. BW had to rescue and relocate fish and crayfish from the lock chambers before they could be completely drained. And thats why we are going towards Sowerby Bridge. With luck we may help in the Hebden Bridge Towpath Tidy. It doesn't take long to get to Wakefield. This is Fall Ing Lock. Well it is at the bottom. At the top it is Fall Ings Lock. Perhaps they only had enough paint for one S.
We moored up for an hour shortly after the lock so that I could have a wander. Mainly so that I could Twitter Sur le pont Wakefield. 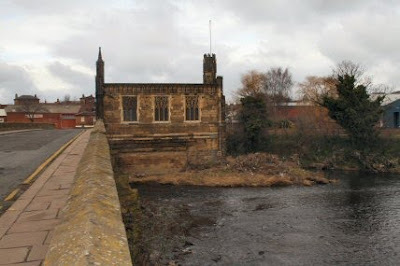 The stone bridge was built soon after 1342 and replaced an earlier bridge over the River Calder. The packhorse bridge was added in 1730. 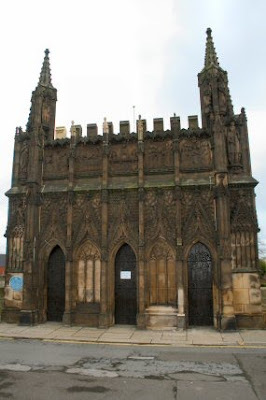 The Chantry Chapel of St Mary was built between 1342 and 1356 is one of only four surviving in England. 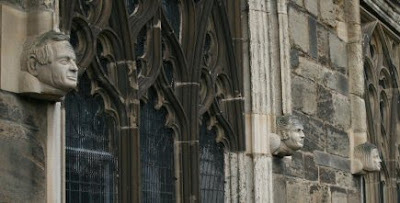 On the other side the faces have been renewed and look as though they represent real people from the history of Wakefield. 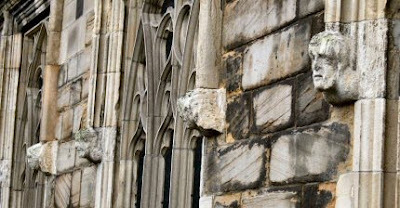 The saints are in the niches at each corner and includes Sts James, Oswald, Christopher and Botolph. Patron saints of travellers in some form or other. The nice thing is that the chapel is still in use with a service held on the first Sunday of each month. Out through the flood lock and away from Wakefield. 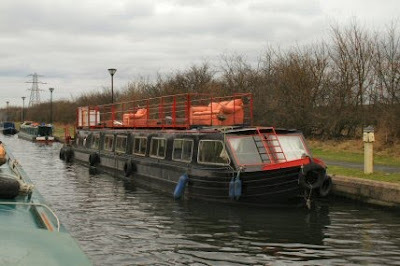 For the next couple of hours we hopped from river to canal and back again. 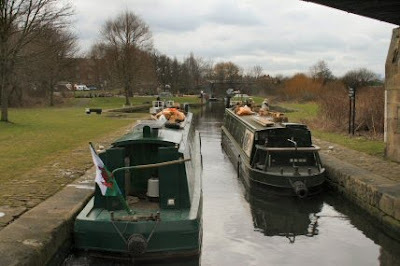 There are lots of locks but in the main they are paired with a flood lock that is generally open.